Two more videos in the ongoing series about the Zero Additional Taxes Bond Issue on the November 8th ballot have been released. Be sure to watch retired community member and Bulldog Grandpa Dave Humpal share his thoughts about why keeping our schools strong is important. Residents can also hear from Olmsted Falls Board of Education President Joe Bertrand as he provides information about why the board took action to place issue 117 on the November ballot. This series of videos have been put together to share information about the upcoming Bond Issue with the community. To view these latest two videos, as well as previous videos in the series, please click HERE. Thank you to all the parents and community residents who attended last week’s State of Schools event held Oct. 26 in the OFHS Auditorium. OFCS Superintendent Dr. Jim Lloyd, Treasurer Emily Dales and OFHS teachers Liz Cleary and Dena Kotz were featured speakers for the evening. 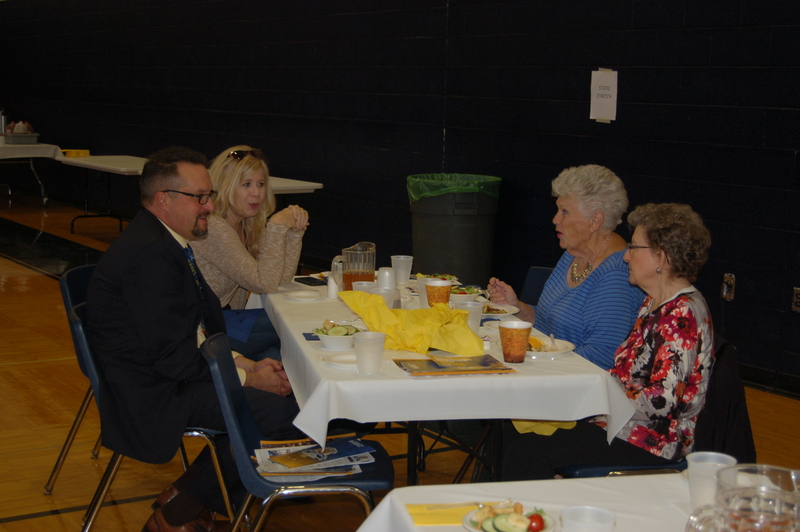 Members of the Olmsted Falls Board of Education were also in attendance. A wonderful representation of students performing and visual arts was also a featured component of the evening. OFCS would like to thank Ryan Patterson and the OFMS Golden Harmonies, and Julie Budd and members of the OFHS band for their outstanding musical performances. 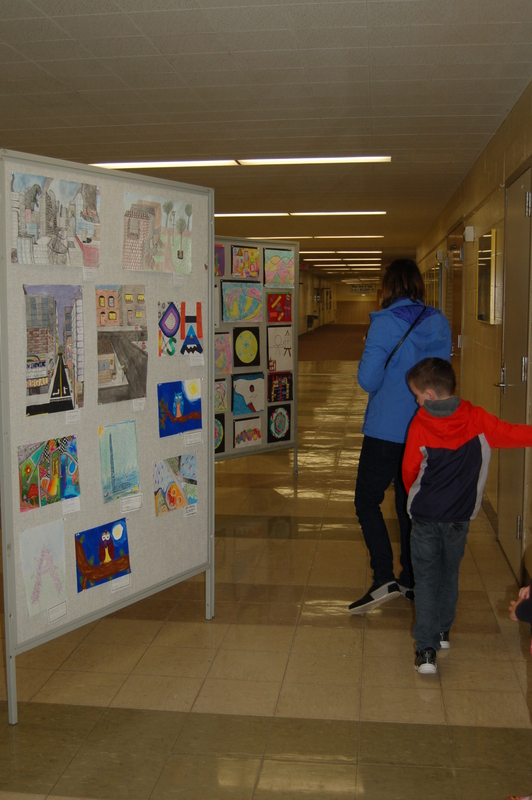 We’d also like to extend thanks to our art teachers and student artists from across the district for putting together the amazing collection of artwork which was on display outside of the auditorium for guests to enjoy. 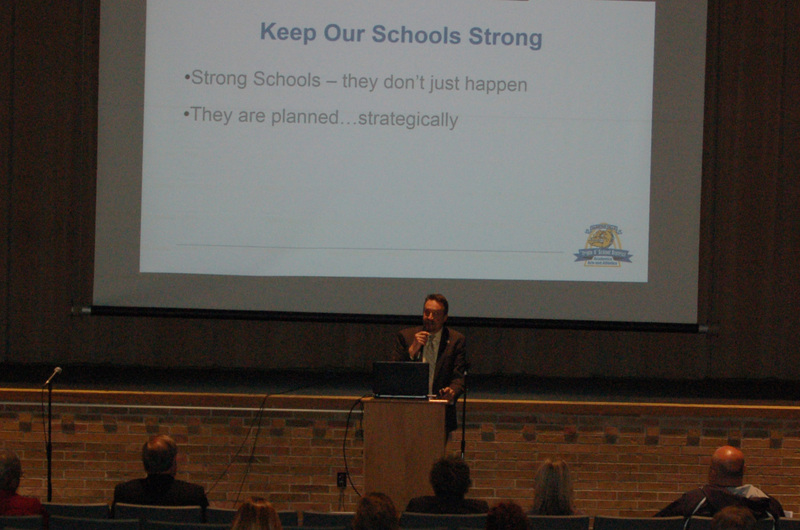 For those interested who were unable to attend, video footage of the State of the Schools presentation will soon be posted to the District website. Please watch the blog for notification once the files have been uploaded and are available to view. Earlier this month the Board of Education approved the district’s latest Five-Year Forecast. This is a financial planning tool that is required by the State of Ohio and shows three years of actual financial data, (Fiscal Years 2014-2016) current projections and what the district thinks will happen from a financial perspective in the future (Fiscal Years 2017-2021). It is an excellent tool that shows the district’s effective and efficient daily operations and how we continue to be good stewards of the taxpayer dollar. This particular forecast also demonstrates the impact that Issue 117 can have on the district’s bottom line. The November 8 ballot issue is a combined bond and permanent improvement levy that will pay for upgrades to mechanical systems and school renovations, and by law none of the money can be spent on school salaries or administration. It will not increase taxes to residents because existing bond and permanent improvement issues are being paid in full or expiring in both December 2016 and December 2017. So this truly is a zero additional taxes issue. Yet what we see in the Five-Year Forecast is what happens if voters do not approve Issue 117. Without dedicated funds to help repair things that break or ongoing maintenance in our schools, the district is forced to pay for these necessary repairs out of the general fund. These dollars pay for the district’s day-to-day operating funds for things such as teachers, textbooks and utility costs. This means that if a roof needs to be repaired or a heating system goes out that the district is forced to reduce the teaching and learning budget to pay for these vital repairs. This forecast shows that as a reality. Issue 117 allows the district to ensure a suitable environment for learning while avoiding cutting teachers or programs to pay for needed repairs and construction. This zero additional taxes bond issue will bring Olmsted Falls Schools’ technology and classrooms into the 21st century and help to maintain the current excellent quality of education that exists today. If you have any questions about Issue 117 or the district’s Five-Year Forecast please contact the district. We are happy to help and eager to make sure our residents have a complete understanding of the financial picture of our schools. 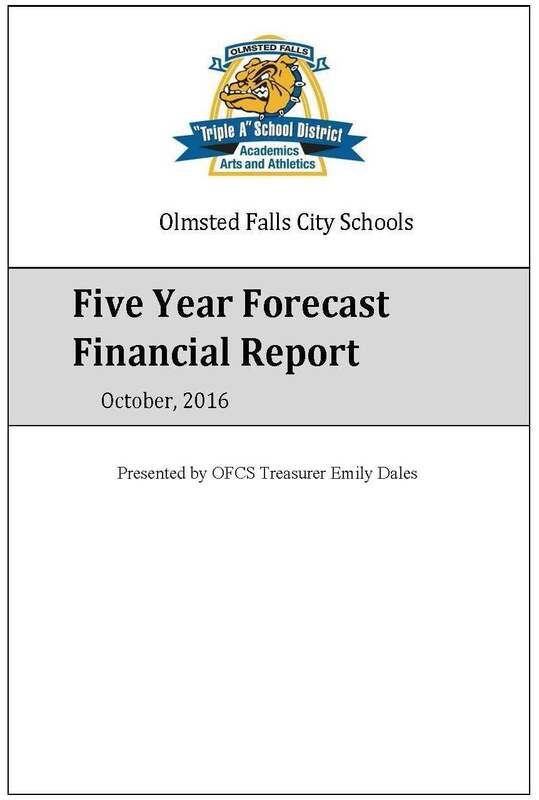 To view the complete Five-Year Forecast, approved by the Olmsted Falls Board of Education at its regular October meeting, please click HERE. 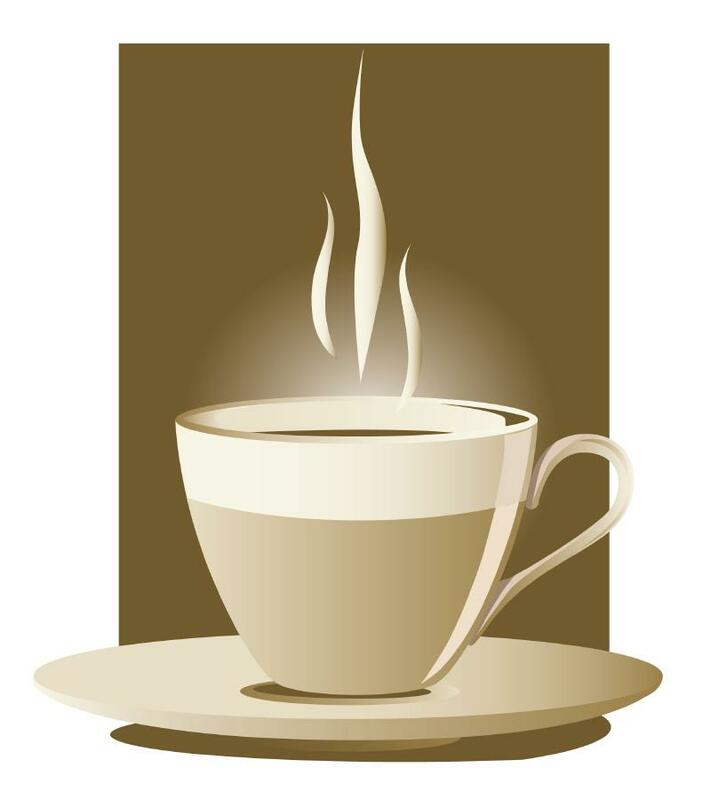 Superintendent Dr. Jim Lloyd has also been hosting a series of Coffee Chats. This is a chance for residents to talk to Dr. Lloyd and ask meaningful questions about what’s happening in schools today. • THIS THURSDAY, November 3 from noon to 1 p.m.
Absentee voting is already underway. Whether you are voting by mail or at the polls on November 8, Olmsted Falls School District wants to ensure residents have all the information you need to cast an informed vote. The ballot language for Issue 117 features two components, that are combined into a single vote. These components are 2.2-mills of bond money and 1-mill of permanent improvement dollars for ongoing maintenance and improvements of school facilities. Please note that while the ballot language for the 1-mill permanent improvement component of Issue 117 by law must read “additional property tax,” passage of Issue 117 does result in ZERO ADDITIONAL TAXES TO RESIDENTS. This is because 5.5 mills of existing permanent improvement and bond millage are coming off the books by the end of 2017. In fact, five of these mills are actually paid in full in December 2016. Any parents or district residents with questions are encouraged to contact the Board of Education office at 440-427-6000 before casting your vote. Congratulations to the newest members of the National Honor Society, inducted this past Wednesday, October 26th at the annual Induction Ceremony held in the OFHS auditorium. NHS advisors Mr. Brian Insley and Mrs. Virginia Wendling were joined by OFHS social studies teacher Tom Gibeaut, who served as this year’s featured faculty speaker for the special ceremony. A total of 9 seniors and 50 juniors were inducted as new NHS members in front of an audience of family and friends. Congratulations to all of our this year’s NHS members! To view this year’s NHS Induction Ceremony program featuring listing of all member names, please click HERE. 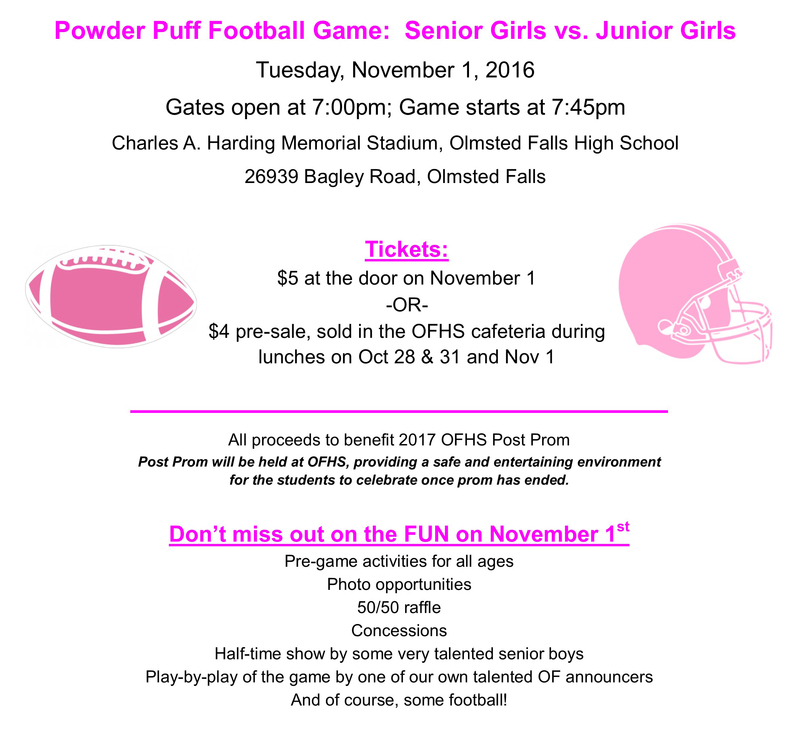 DON’T MISS THE ANNUAL POWDER PUFF ACTION – TOMORROW NIGHT – NOV. 1ST @ 7:45 P.M.
NEXT OLMSTED FALLS MUSIC ASSOCIATION MEETING – THIS WEDNESDAY, NOV. 2ND @ 7:00 P.M.
All are invited to join the next monthly OFMA meeting scheduled for this Wednesday, November 2nd at 7:00 p.m. in the High School Choir Room. A big thank you to all who helped in the Yankee Candle drive. We sold $40,500 worth of Yankee products, which will net 40 percent for the PTA. Yankee Candle boxes have arrived at Falls-Lenox and ECC. Look for emails or backpack slips for pick-up dates and times. 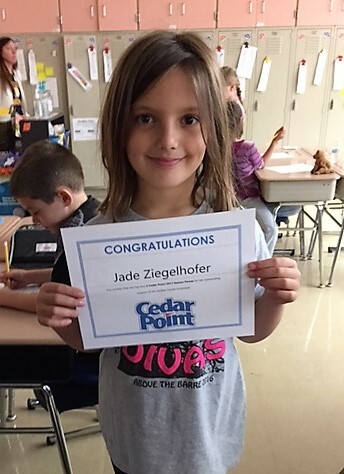 Top Selling Class, F/L, Mrs. Vasco’s Grade 1, Skyzone jump passes for each child. Top Selling Class, ECC, Mrs. McNeeley’s Kindergarten, Skyzone jump passes. Top Participating Class, ECC, Mrs. McNeeley, 74-percent class participation, class party. The OFHS guidance counselors invite parents to this year’s FINAL Coffee & College informational sessions about the college application process. The final session is from 8-9 a.m. Monday, November 7th in the OFHS Media Center. To see an informational flyer, click HERE. Due to a time conflict, Baldwin Wallace University had to change the time for this Saturday’s – October 29th – second part of its College Essay Writing Workshop. It is now from noon to 2 p.m. in the OFHS Media Center. Please check out the Counselors’ Corner website for upcoming dates and important information by clicking HERE. Congratulations to the OFHS cross country teams that traveled to the Strongsville Invitational and ran quite well with some of the toughest competition in the state. Scoring and leading the girls were Sarah Makari, Madi Sobieski, Kaylee Gomez, Sidney VanScoy, Abbey Clark and Maggie Backus. The boys traveled to the Valley Forge Invitational at Tri-C and took third overall. Leading the boys were Griffin Purdy, Collin Cook, Joe Backus, Andrew Gluvna, Ryan Kolesar and Caleb Prante. The team was in action again over the weekend competing in this past Saturday’s Gilmour and Western Reserve Invitationals. 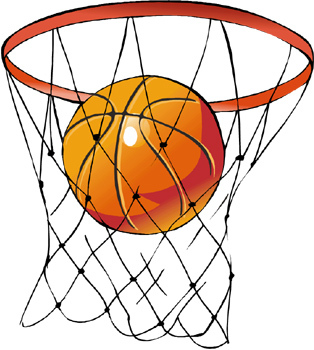 Boys in grades 4, 5 and 6 may register for this year’s Boys Developmental Basketball League. The last registration day is October 29th. Players will have skill sessions and play team games on Saturdays at the OFHS gym during the months of November and December and one Wednesday game. OFHS basketball coaches and players will teach the skills, which emphasize basic skills, games rules and teamwork in an atmosphere designed to be educational and fun. All participants will be invited to play at halftime of a varsity boys basketball game. The cost is $60. For more details and a registration form, click HERE. 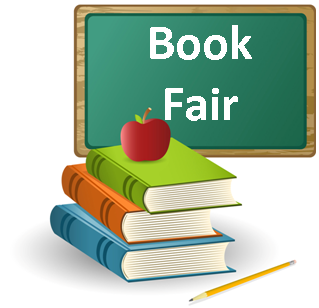 The Olmsted Falls Middle School Media Center will sponsor the Fall Scholastic Book Fair from Friday, November 4th through Monday, November 14th. The fair will be open both conference nights, which are Monday, November 7th and Thursday, November 10th, from 4-7:30 p.m. Stop by and check out some great material. Help – and enjoy – Olmsted Falls Music Association’s annual Wing Nite/Music Trivia fundraiser from 7-11 p.m. November 12th at St. Clarence Hall. Volunteers are needed as raffle sellers, side boards handlers, set-up, clean up and much more. All donations also will be appreciated. To sign up, click HERE for the SignUpGenius form. The evening includes food, beverages, music trivia, karaoke, great company and many chances to win a prize. The event costs $20, which includes food and a chance at a door prize. Fill a table with a party of 6 to receive an additional door prize entry. Seating is limited, so hurry. To view the event’s flier, click HERE. Attention ALL Olmsted Falls Dancers, Singers, Comedians, Musicians, Jugglers, Bands and Magicians ages Kindergarten through 12th Grade!!! Is there another talent you have?? We ask you to bring it!!! 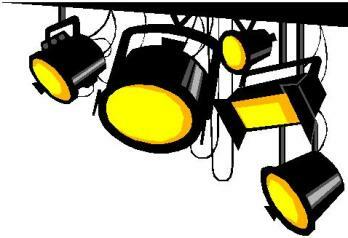 The 30th Annual Olmsted Falls High School PTA Talent Show Auditions will be held on Saturday, November 12, 2016 from 9 am to Noon in the High School Auditorium. Our Bulldogs are awesome performers, we can’t wait to see what you have in store for us this year. Please watch this weekly blog and look for posted flyers in your school for more details. 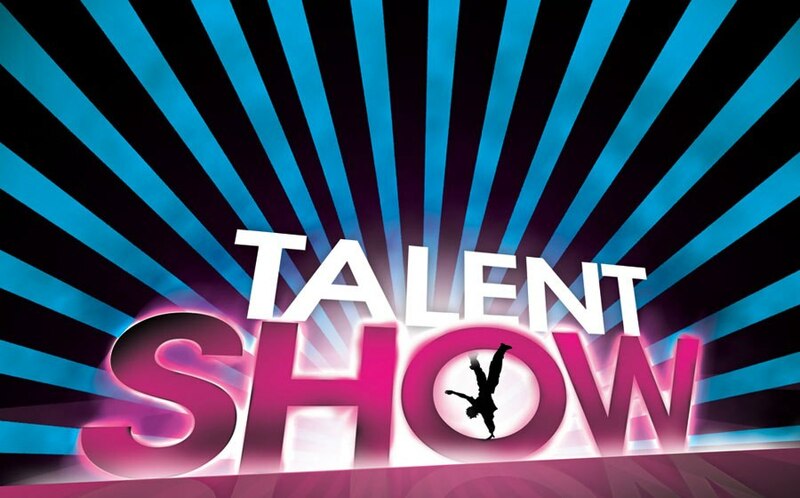 The High School PTA Talent Show will be Saturday, January 28, 2017 – Mark your calendars! For information please contact Mrs. Knaggs, 440-463-8106, or msknaggs92@sbcglobal.net or Mrs. Ferrini at 440-427-0894or claudiaferrini@sbcglobal.net. with questions. 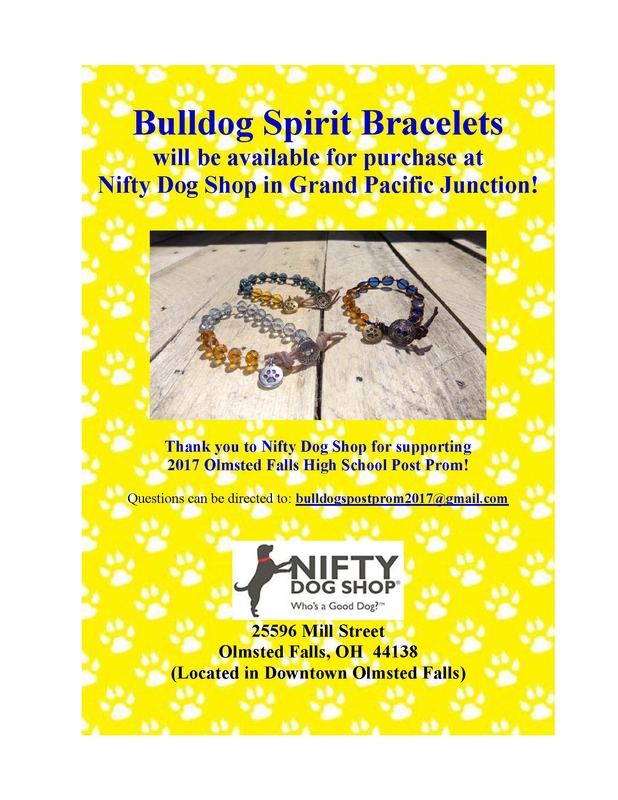 Thank you to Nifty Dog Shop (25596 Mill St) in Grand Pacific Junction for having our bracelets for sale. Please stop by anytime, they will be available for the next several months. Mention organization when placing order & earn up to 25% of sales for Olmsted Falls Post Prom! (percentage earned based on total sales) Dine-in, Carry-out, Drive Thru or Cater! Soliciting for the Spirit Day on Chick-fil-A North Olmsted property is strictly prohibited and will result in any monies raised being forfeited. To download a copy of the flier, click HERE. Location: Olmsted Falls High School Cafeteria – 26939 Bagley Road, Olmsted FallsJoin us for some holiday shopping with awesome vendors, such as Yankee Candle, 31 Bags, Touchstone Crystal by Swarovski, Pampered Chef, Mary Kay, The Swa-Berry Patch; Pastry Chef, Premier Jewelry and many more.Questions or want to be a vendor at our event? Email: bulldogspostprom2017@gmail. Join our next meeting: Wednesday, November 16th @ 7:00 p.m.
Dine from 4-8 p.m. Nov. 14 at North Olmsted’s Chipotle and help the OFHS Swim/dive team. Click HERE to download a flyer to present with your order. Dine in or take your order home. If you forgot the flyer, be sure to tell the cashier at the checkout you are there for the fundraiser. Use of an existing gift card with your purchase is permitted. The restaurant is at 26420 Great Northern Shopping Center, North Olmsted. The flyer may be printed or on a cell phone. 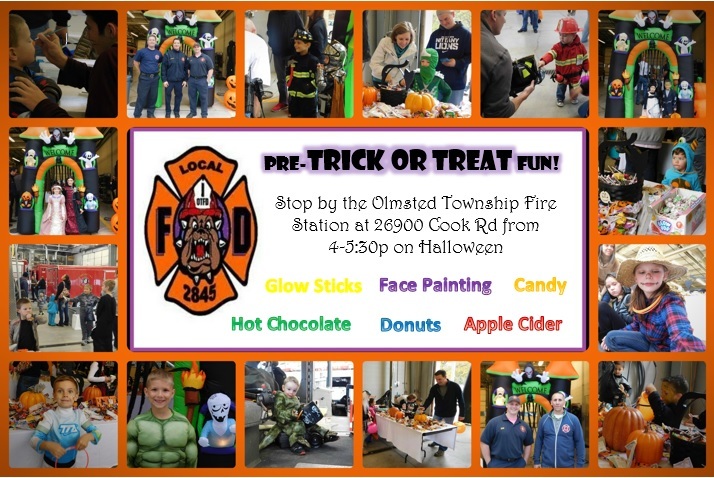 Children are invited to stop by the Olmsted Township fire department from 4-5:30 p.m. on Halloween, this Monday, October 31st and enjoy some free fun. Bring the family for glow sticks, face painting, candy, hot chocolate, donuts and apple cider. The station is at Cook and Fitch roads. COMMUNITY TRICK-OR-TREAT HOURS ARE TONIGHT, OCTOBER 31ST FROM 6-8 P.M.
Bulldogs, be safe and have fun!! 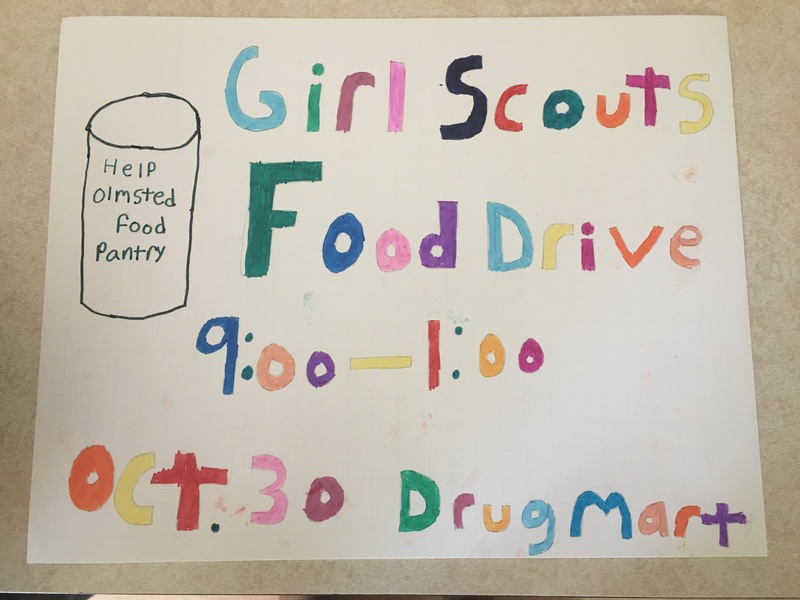 The Olmsted Falls Sixth-Grade Girl Scouts are having a food drive to support the Olmsted Falls Food Pantry. Please drop off non-perishable food items Sunday, November 6th from 5:30-8:30 p.m. at the North Olmsted Rec Center Ice Rink and Saturday, November 19th from 6:30-7:30 or 9:30-10:30 p.m. at the Olmsted Community Center (before or after Saturday Night Activity Night). All donations will be taken to the Olmsted Falls Food Pantry. 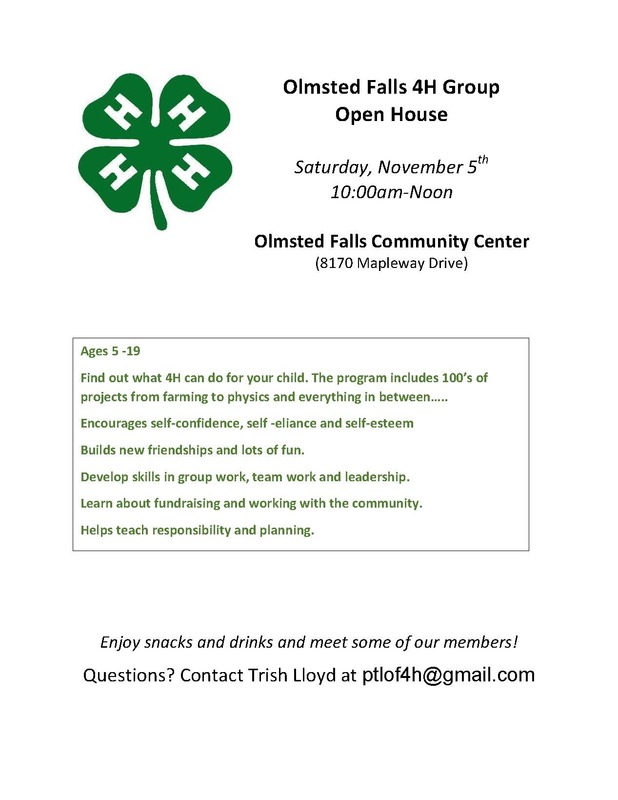 Come learn about opportunities for 5-18 year olds to become involved in 4H. Members choose from a wide variety of projects from farming to physics to cooking and everything in between! Participating in 4H helps encourage self-confidence, self-esteem, and leadership abilities. Learn about fundraising and working in the community while making new friends. For more information contact Trish Lloyd at ptlof4h@gmail.com. The Olmsted Performing Arts invites the community to a free seminar by Peter Sklar at 2 p.m. November 12th. Sklar is considered America’s leading expert on young talent. He will reveal the universals of interviewing for college, business or any job based on his contributions on Broadway, dance, music, film and other experiences. Admission is free. RSVP by calling 440-973-4363. OPA is at 611 W. Bagley Road, Berea. 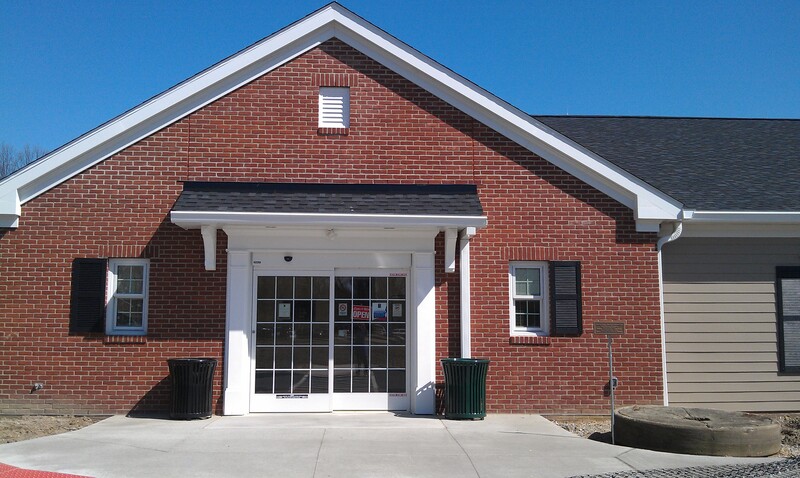 The Olmsted Community Center is accepting applications for its Holiday Home & Craft Shoppe. The event will be from 9 a.m. to 4 p.m. November 12th at the Center. The price for an 8-foot space is $35. Last year the show saw more than 500 attendees. A space application form can be found at www.olmstedcc.com. TONIGHT – WEDNESDAY, OCTOBER 26TH @ 6:30 P.M. The latest video about the Zero Additional Taxes Bond Issue on the November 8th ballot has just been released. Be sure to watch Bulldog parent Julianne Allen share why the zero additional taxes bond issue is important to parents. 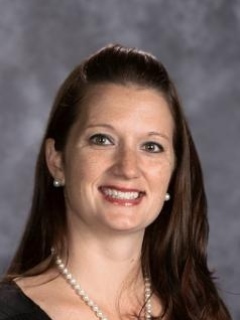 To view Mrs. Allen’s video, as well as previous videos in the series, please click HERE. BTC’s production of “Anything Goes” opened to rave reviews Thursday night. 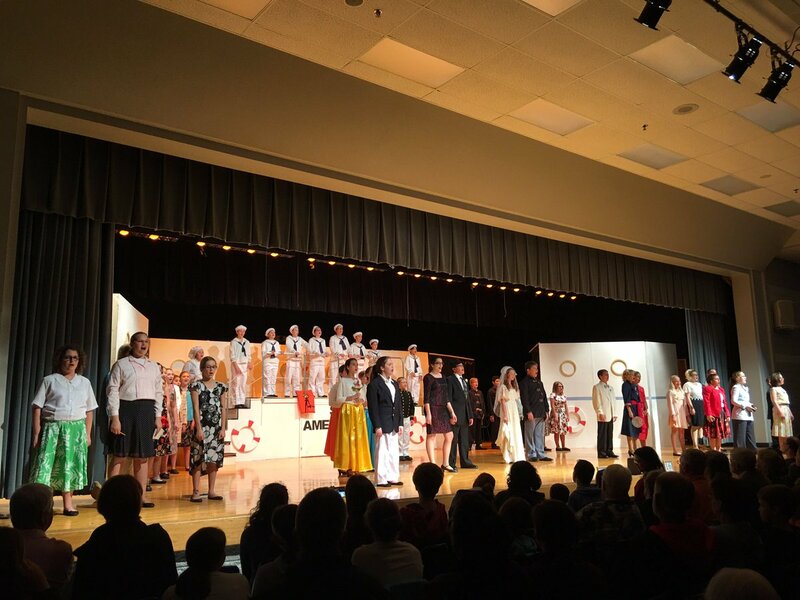 Olmsted Falls Middle School Bulldog Theater Company’s performance of the classic Broadway musical Anything Goes opened to rave reviews on Thursday night! Don’t miss the chance to see this fantastic show! Two more performances are scheduled for Friday and Saturday nights. The show starts at 7:00 p.m. on the OFMS cafetorium stage. Tickets are $5 for adults, $3 for students (4th grade and up), and free for senior citizens and students (3rd grade and below). This promises to be a fun event for the entire family! Kudos to the talented students of BTC! Congrats on another great production! Superintendent Dr. Jim Lloyd (left) and OFHS Principal Holly Schafer (right) help honor five OFHS students recognized by the National Merit Scholarship Program. 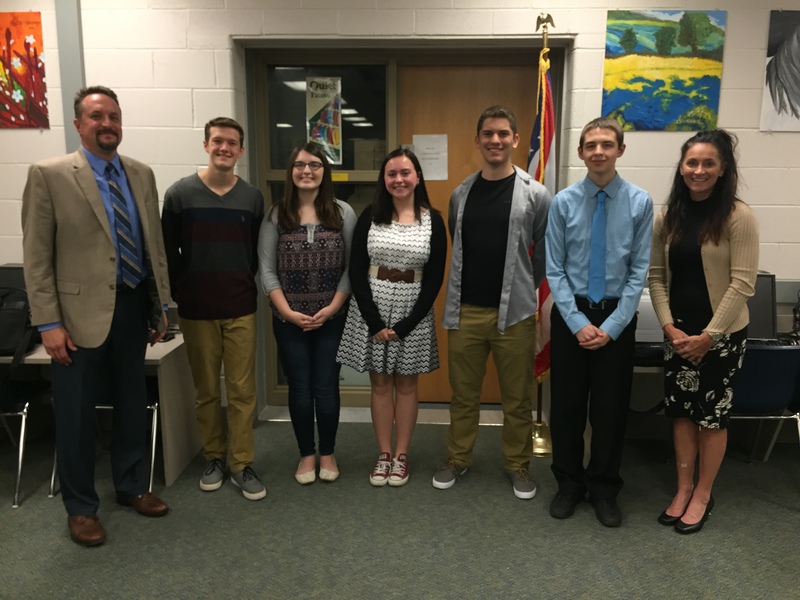 The Olmsted Falls Board of Education at its monthly meeting honored five OFHS students who performed well in the 2015 Preliminary SAT/National Merit Scholarship Qualifying Test last year. The five seniors are Eli Tomasch, who is a National Merit Scholarship Program Semifinalist, and Mark Drobnak, Morgan Finau, Ouen Mali and Molly McCafferty, the latter four who earned Commended status. More than 1.6 million students took the test and entered the National Merit Scholarship Program. The National Merit Scholarship Corporation identified the 50,000 highest scorers. Then 16,000 of those high performers became Semifinalists, who have the chance to continue in the competition and advance to Finalist standing by meeting several additional requirements. Good luck to Seth Tomasch as he advances to the next level of competition, and congratulations again to all of these fine students! Olmsted Falls City Schools knows that residents often have questions about what’s happening in the school district, especially related to the zero additional taxes bond issue on the November 8th ballot. To help increase the dialogue about this and other important school issues there are now two new ways to get the answers you want to your questions. Lots of residents want more specific information about issue 117 on November 8. To help address these questions, the district will hold it final informational night at 7 p.m. at Olmsted Falls High School. Facts will be presented and attendees will have the opportunity to have their questions addressed by school district leaders. Get the answers to your questions so you are able to cast your vote on November 8. • November 2 from 8-9 a.m.
• November 3 from noon to 1 p.m. If you missed last Friday’s spectacular Bulldog football game against Avon Lake, you have the opportunity to view the band performances and Senior Night announcements for fall sports right here. 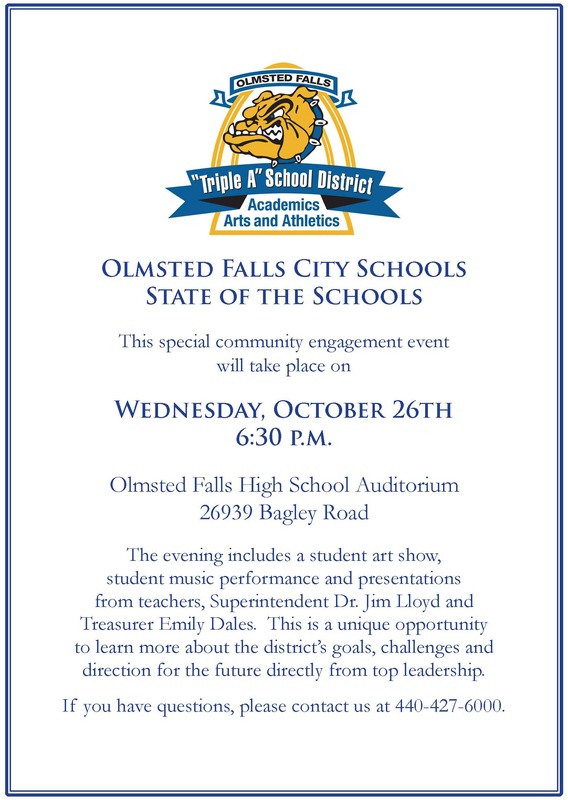 SAVE THE DATE: COMMUNITY INVITED TO STATE OF THE SCHOOLS EVENT – NEXT WEDNESDAY, OCT. 26TH @ 6:30 P.M.
On October 26 Olmsted Falls City Schools residents will have the opportunity to hear about what’s going on in the district straight from top leadership. A State of the Schools community engagement opportunity will happen at Olmsted Falls High School Auditorium beginning at 6:30 p.m. The event will feature student performances as well as remarks from Superintendent Dr. Jim Lloyd regarding the status of the school district. Dr. Lloyd and other top leaders will share challenges and triumphs that are happening today as well as goals for the future of our schools. Please be sure to join community members from across the district for this unique opportunity. 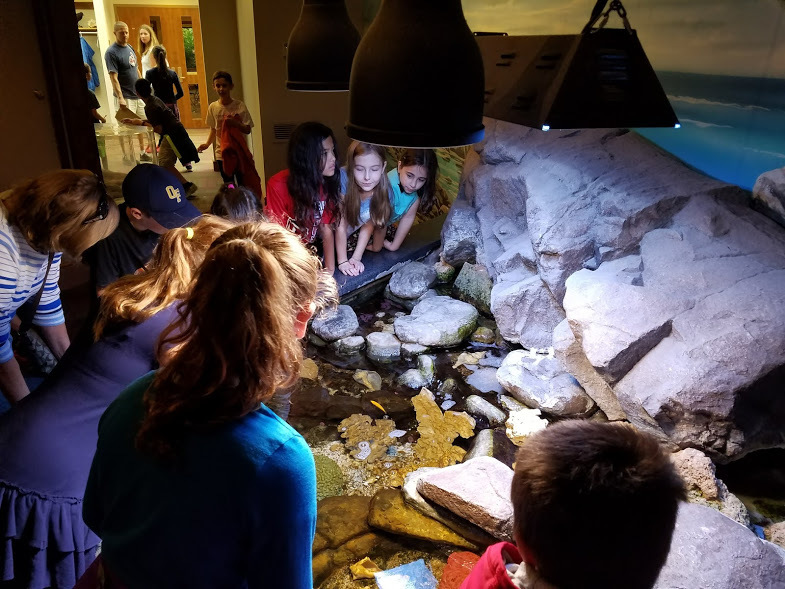 The fourth-grade students journeyed to the Lake Erie Nature and Science Center in Bay Village this week. 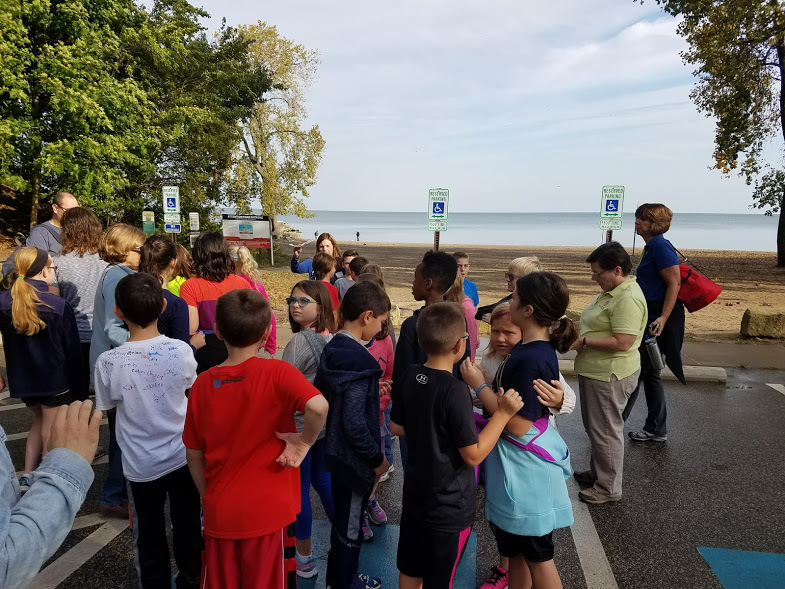 The field trip took them to the Center and to the shores of Lake Erie to test areas of the water. To see a photo gallery of the trip, click HERE. 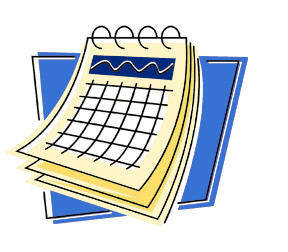 FALLS-LENOX/ECC PTA CHANGES START TIME OF OCT. 25TH MEETING TO 6:00 P.M. The FLECCPTA meeting on Tuesday, October 25 at Falls-Lenox has been changed to 6PM so everyone can go home to watch the World Series! 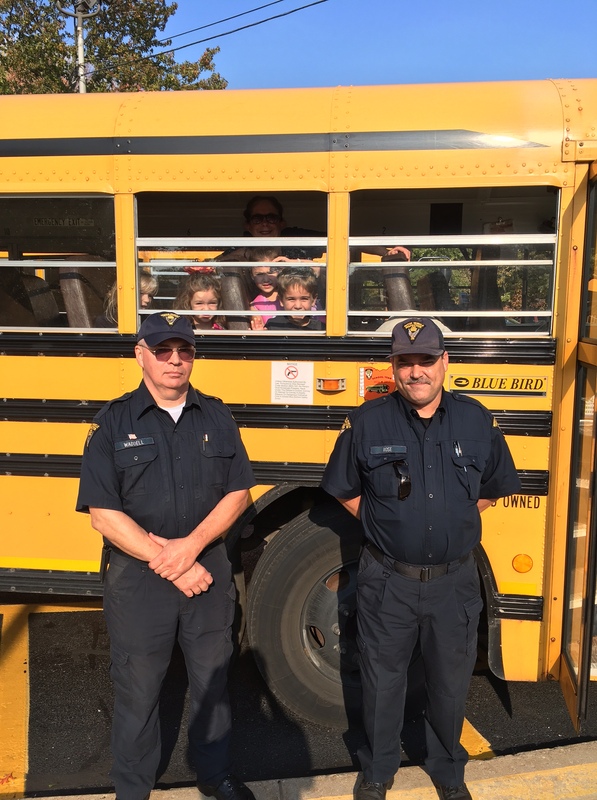 An Ohio State Highway Patrol Motor Vehicle Inspection team visited Olmsted Falls Schools Tuesday in support of National School Bus Safety Week. The team visited all the buildings during morning and afternoon drop-off times. The OFCS Transportation Department appreciates our partnership with the OSHP MVI team! Thank you for helping us promote safety in Bulldog country! The OFHS guidance counselors invite parents to this year’s Coffee & College informational sessions about the college application process. The next evening session is from 6-7 p.m. on October 24th in OFHS Room W3. (Please note change in start time for this evening event). The final morning session is from 8-9 a.m. November 7th in the OFHS Media Center. All are on Mondays. To see an informational flyer, click HERE. Baldwin Wallace University will have the second part of its College Essay Writing Workshop from 9-11 a.m. on Saturday, October 29th, in the OFHS Media Center. 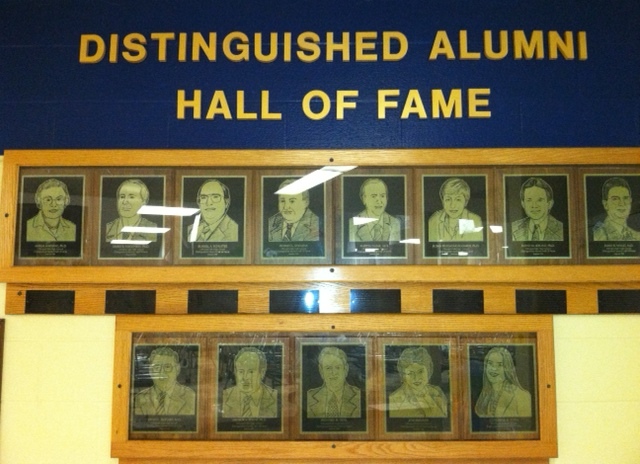 The Olmsted Falls School Endowment and Alumni Association will induct five alumni and one educator into the OFHS Distinguished Alumni Hall of Fame Oct. 27. The inductees are Carl Gerbasi, class of 1962, education; Nan A. Baker, ’73, business/politics; Ron Smith, ’75, business/insurance; Greg Butcher, ’76, business/engineering; Pamela Ehresman Pennock, ’90, educator/write and Kevan Stuber, music/educator. 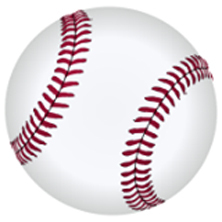 They join 59 notable individuals who are now in the Hall of Fame. The induction ceremony is Thursday, October 27th at the Donauschwaben’s German-American Cultural Center, 7370 Columbia Road. The community is invited to attend the ceremony and its dinner. Tickets are $35. Click HERE for a reservation form. Contact Cathy Hess, alumni director, 440-427-6030 or ofhsalumni@yahoo.com for more details. Homework Centers and Homework Mentors programs will provide students in kindergarten through eighth grade with free access to afterschool homework help during the 2016-2017 school year. The HOMEWORK MENTOR program will be available at the Cuyahoga County Public Library OLMSTED FALLS BRANCH Monday through Thursday, 3:30 to 5:30 p.m., beginning Wednesday, October 19th to students in your school district. Students who participate in the program will receive homework assistance from trained staff in language arts, reading, math, science and social studies. Cuyahoga County Public Library recognizes that homework is an important extension of the school day as it reinforces the lessons that take place in the classroom. We also recognize that students may struggle with their homework if they do not fully comprehend their lessons. To that end, our Homework Mentors will provide the guidance students may need to better comprehend their lessons and successfully complete their homework assignments. Please be there 15 minutes before your scheduled tryout time to register! Bring: $5.00 tryout fee (cash or check made out to Olmsted Falls Athletic Boosters); Kneepads; Parent/Guardian will need to fill out information sheet; parents will not be permitted in gym during tryouts. If this is your first experience with club volleyball, please check out www.ovr.org for information about the overall structure of the club volleyball experience. The OFVA website is: http://bit.ly/OFallsVA. The number of players on a team may vary. OFVA Bulldogs Volleyball Club attempts to limit the team size to 9-11 so that everyone gets maximum playing time. Playing time is not guaranteed. We select athletes based on the following criteria: Coachability, willingness to be a team player, athletic ability for volleyball, athletic potential, work ethic, drive, competitive attitude, and current skill ability and/ or experience. Cost: Depending on the team made (10’s, 11’s, or 12’s), the cost will be between $300-375, plus a $65 OVR registration fee. Practices: Teams will practice twice a week, TBA. 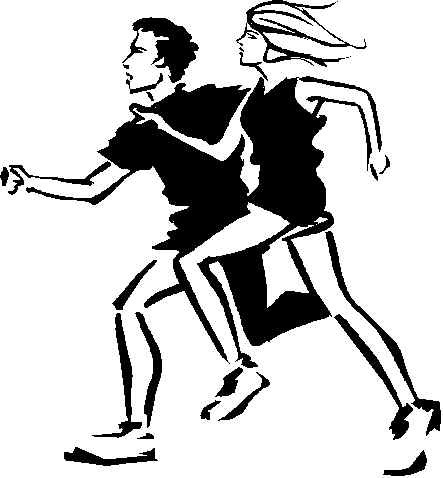 We will be given gym time by the Olmsted Falls BOE at a later date. Practices will begin mid-December through mid- May. Practices may start as early as 4:00 or as late as 7:30 pm. Tournaments: 10’s and 11’s teams will play in between 4-6 tournaments, including OVR championships in Columbus. 12’s team will play in between 6-8 tournaments, including OVR championships in Columbus. Most tournaments are played locally at Ohio Nets, Maverick, and Spirit Facilities. For the most part, tournaments will be within 45 minutes of Olmsted Falls. The exception is OVR Championships, played in Columbus. Tournaments are either Saturdays or Sundays and run from approximately 7 am- 7 pm, in some cases. 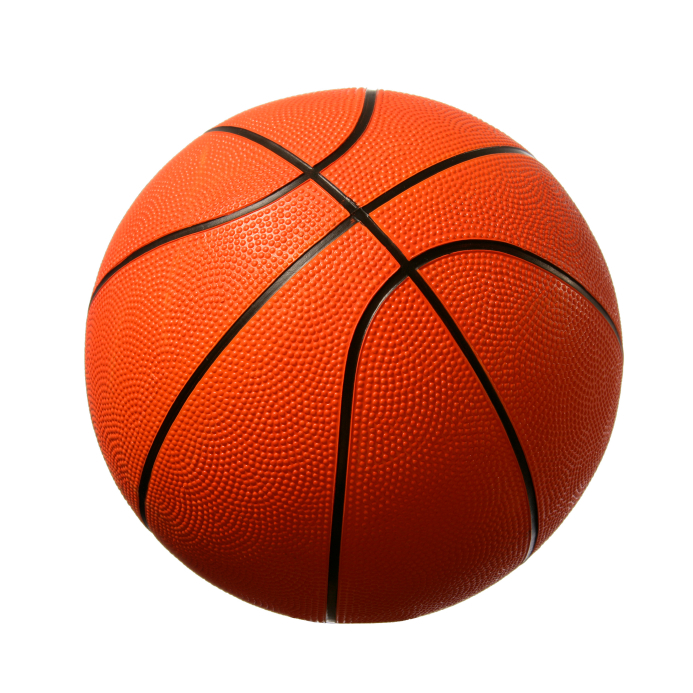 Boys in grades 4, 5 and 6 may register for this year’s Boys Developmental Basketball League. Players will have skill sessions and play team games on Saturdays at the OFHS gym during the months of November and December and one Wednesday game. OFHS basketball coaches and players will teach the skills, which emphasize basic skills, games rules and teamwork in an atmosphere designed to be educational and fun. All participants will be invited to play at halftime of a varsity boys basketball game. Registration is open through October 29th. The cost is $60. Dads, grandpas or other important guys in your children’s lives are invited to spend time at school during OFIS PTA’s Donuts with Dads from 7-8 a.m. November 4th. RSVP deadline date is October 26th. This is only for PTA members – a benefit of joining this group. It’s not too late to join, though. All wishing to attend should fill out the RSVP form by clicking HERE, on which you may also join PTA. Questions? Contact Heather Miranda, jhpcm@yahoo.com or Reghan Laki, rlaki@mac.com. OFCS LAUNCHES OFFICIAL TWITTER ACCOUNT! 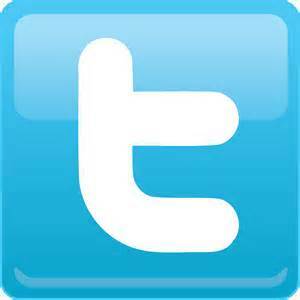 Olmsted Falls City School District is now on Twitter! 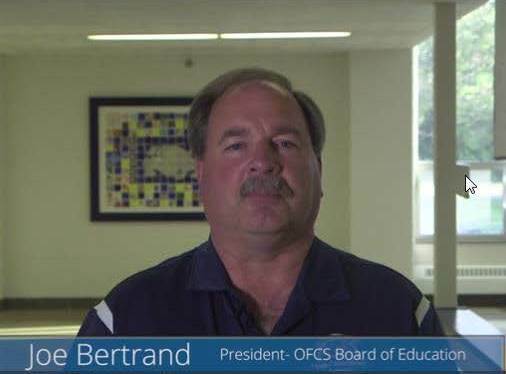 Follow us @OFCSDistrict for the latest Bulldog news and information. Did You Know? All five Olmsted Falls school buildings are now on Twitter! The Olmsted Falls Music Association again is teaming with Easter Seals Northern Ohio in hosting a “Fill the Truck” clothing donation drive. It is THIS WEEKEND – OCTOBER 22ND AND 23RD – in the OF Board of Education parking lot. 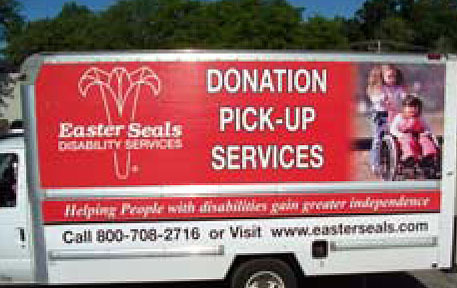 Easter Seals will compensate OFMA based on the number of pounds of cloth items collected. Many items will be accepted, such as clothing, shoes, purse, scarves, gloves, hats, linens, towels – even stained items. The drive cannot accept household items, toys or any items not cloth. All donors will receive a tax-deductible receipt. The truck will be in the parking lot from 9:30 a.m. to 4:30 SATURDAY AND 1-4 p.m. SUNDAY. A detailed list of acceptable items, and more information, is on the flier that may be viewed by clicking HERE. 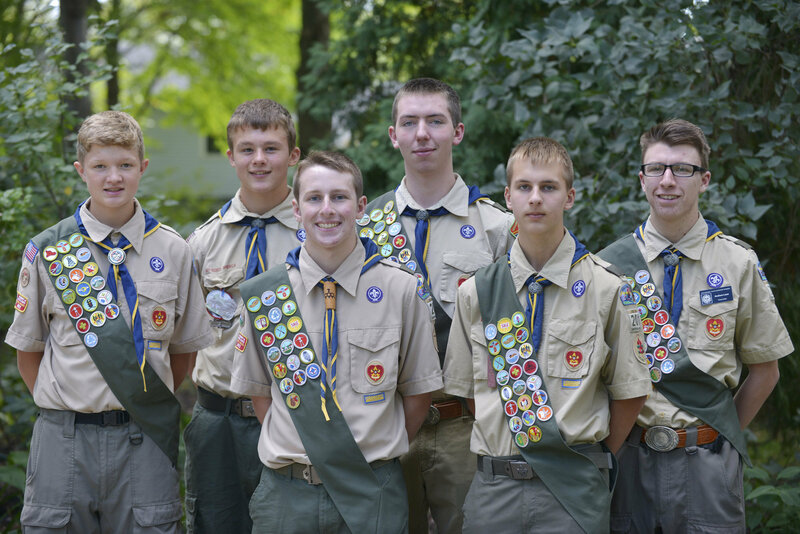 Five of the six scouts who will be honored at this Sunday’s Olmsted Falls Troop 201 Court of Honor are Bulldog students.The Court of Honor is at 2 p.m. Sunday at the Olmsted Falls Middle School. Following the event, the troop will celebrate its 90th anniversary in the community. Scouts receiving their Eagle Scout ranking, which only about 5 percent of Boy Scouts obtain, include Connor Hughes, Andrew Lane, Eric Sobera, Andrew Tomasch, Kevin Walsh and Ryan Walston. All are current OFHS students except for Connor, who is a 2016 grad and Andrew Lane, an Avon Lake High senior. Here is a brief description of the scouts and their Eagle Scout leadership project. Ryan, 15, a sophomore, installed a giant, life-size checkerboard for the Olmsted Community Preschool on the grounds of Olmsted Community Church. Andrew Lane, 18,Shoreman senior, built a 32-foot prayer labyrinth at the Avon Lake United Church of Christ. The Troop was founded Oct. 29, 1926, but troop historians believe it was previously chartered as Troop 1, sponsored by the Olmsted Grange, but now by the Olmsted Falls Kiwanis Club. The troop has produced 150 Eagle Scouts since 1926. All are invited to Sunday’s festivities where the new Eagle Scouts – and the Troop – will be honored. 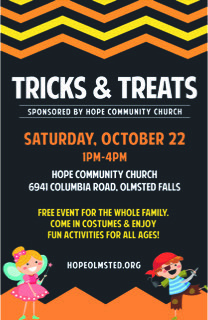 The Hope Community Church offers families a fun, free time at its Tricks & Treats Halloween Party from 1-4 p.m. Saturday, October 22nd. Inflatables, snow cones, popcorn, a cake walk, balloon artist, face painting and several booths to play games will be included with the fun. The church is located at 6941 Columbia Road. 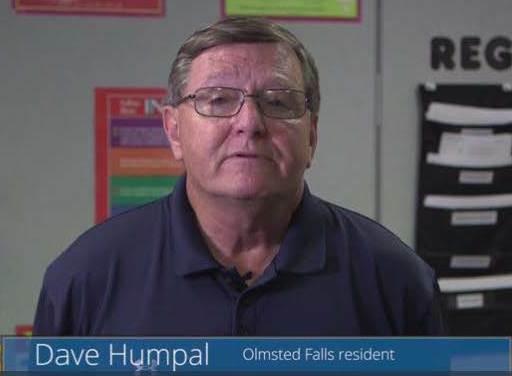 Be sure to watch former Olmsted Falls Kiwanis President and Bulldog parent Tony Budak share how Issue 117 impacts our community in this latest video. This series of videos have been put together to share information about the upcoming Bond Issue with the community. To view Mr. Budak’s video, as well as previous videos in the series, please click HERE. Olmsted Falls City Schools and other school districts across Ohio are closed today, Friday, October 14th, for the annual NEOEA Day. We hope students and families enjoy the long fall weekend! Looking ahead, please also note there will be NO SCHOOL for students on Tuesday, November 8th – Election Day. OFCS staff members will participate in a scheduled professional development day on this date. To download a copy of the complete 2016-2017 school year calendar, please click HERE. Finally, the annual PTA Activities Calendar has been finalized and will be delivered next week. Please watch for calendars to be sent home (one per household) by the end of next week. OFHS VARSITY BOYS SOCCER TEAM IS 2016 SWC CHAMPS! 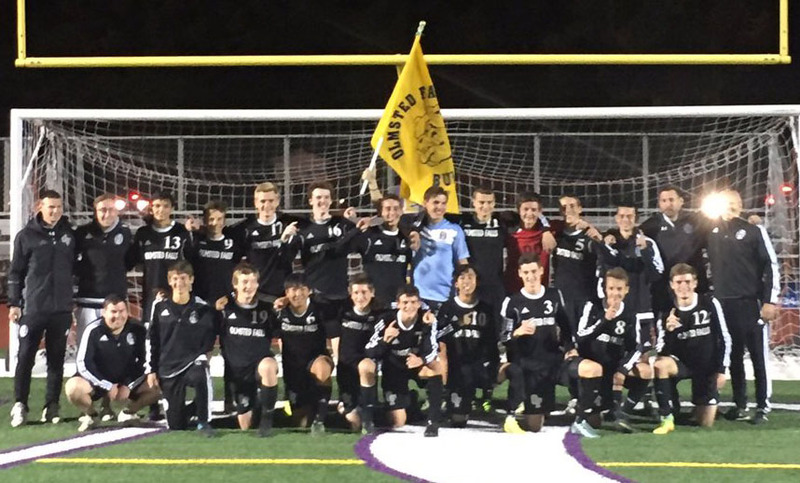 Congratulations to the Bulldog boys varsity soccer team who are SWC champs by beating the Avon Eagles 3-0. This is the first soccer title in school history! Senior Mickey Kasputis scored two goals with Kevin Lemin, junior, scoring the third. Junior Ryan Kolonick earned an assist on a goal. Goalkeeper Austin Mitchell had five saves. To read The Chronicle coverage of the game, click HERE. The team ends its regular season against St. Ed’s at 7 p.m. this Saturday, October 15th. It is OF Senior Night. Congratulations, Bulldogs. Good luck in tournament play. Continue your winning streak! Homecoming 2016 saw many activities last weekend. 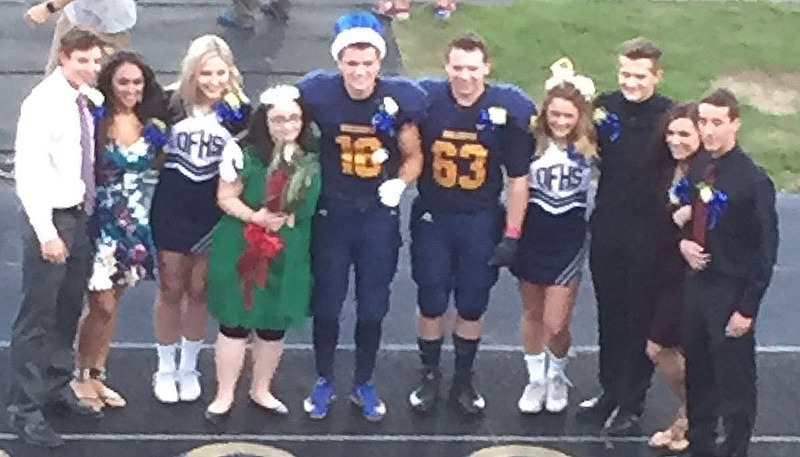 Congratulations to Homecoming Queen Lulu Mustafa, Homecoming King Andrew Tursk i and their entire court. 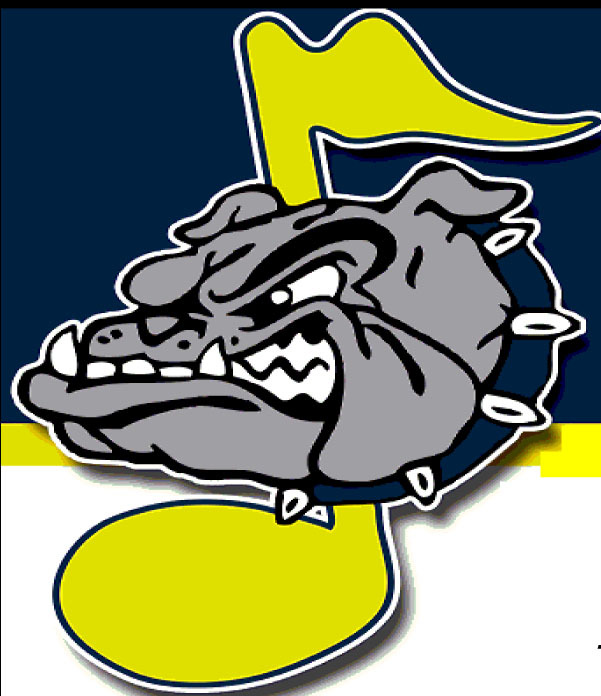 Here are the OFHS Bulldog Marching Band performances from Friday night’s Homecoming game. 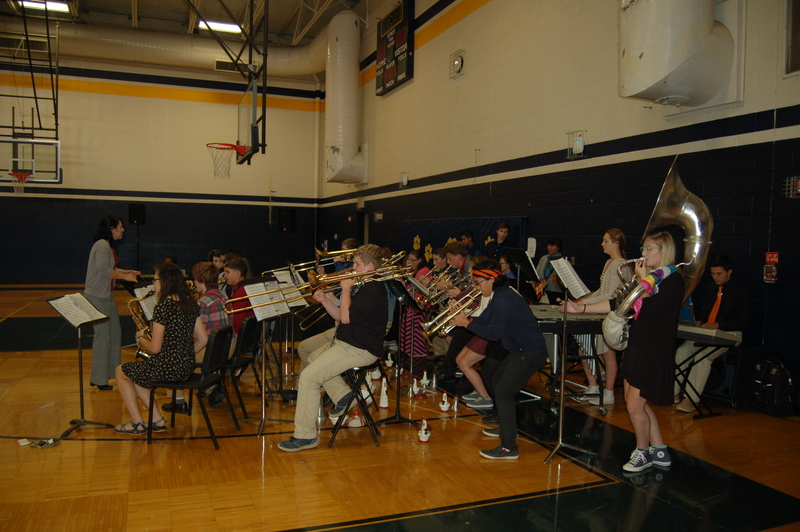 The OFMS 8th grade band also performed in some of the action. Relive the festivities from the grandstands. Click the highlighted words to view the videos. Here are the Bulldogs players! red potatoes, green beans, tossed salad, roll, pumpkin mousse and vanilla ice cream for dessert. Oh, don’t forget the hot and cold apple cider, too! Also attending were board members and district administrators. 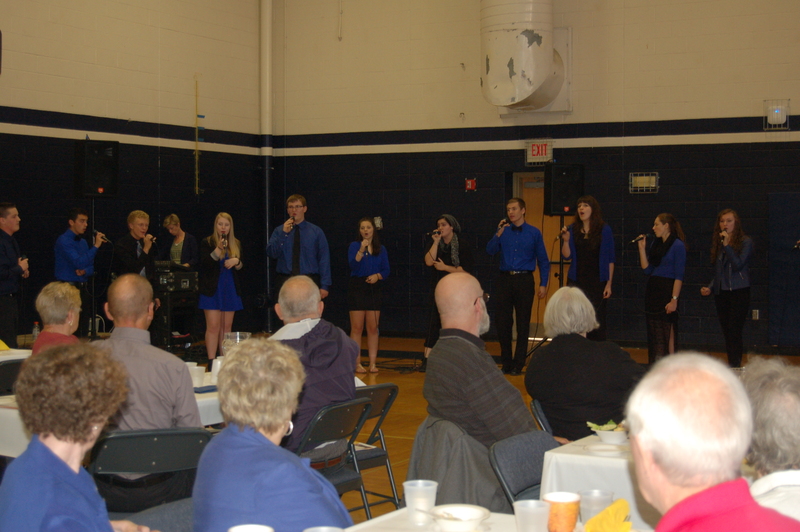 OFHS Jazz Band and the Golden Expressions entertained the group. Dr. Jim Lloyd spoke to the gathering, bringing them up to date with district news. All seemed to enjoy the food, entertainment and camaraderie! To see a photo gallery of the event, click HERE. 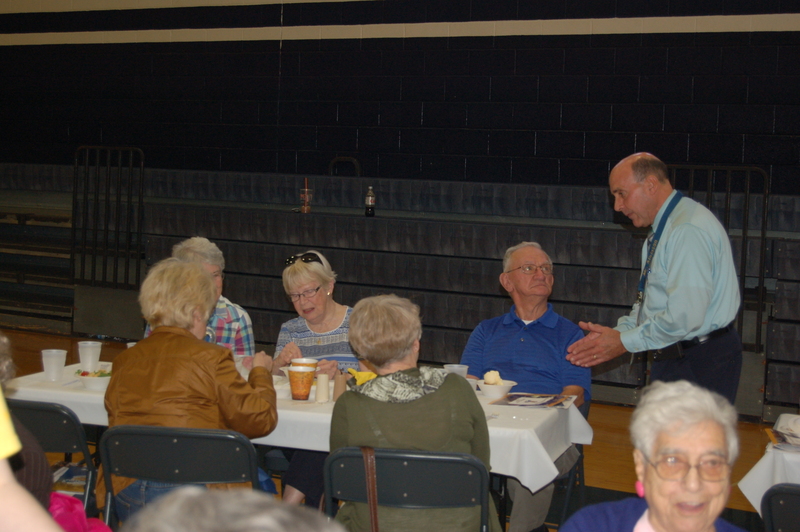 The district plans to continue these senior luncheons each fall and spring. 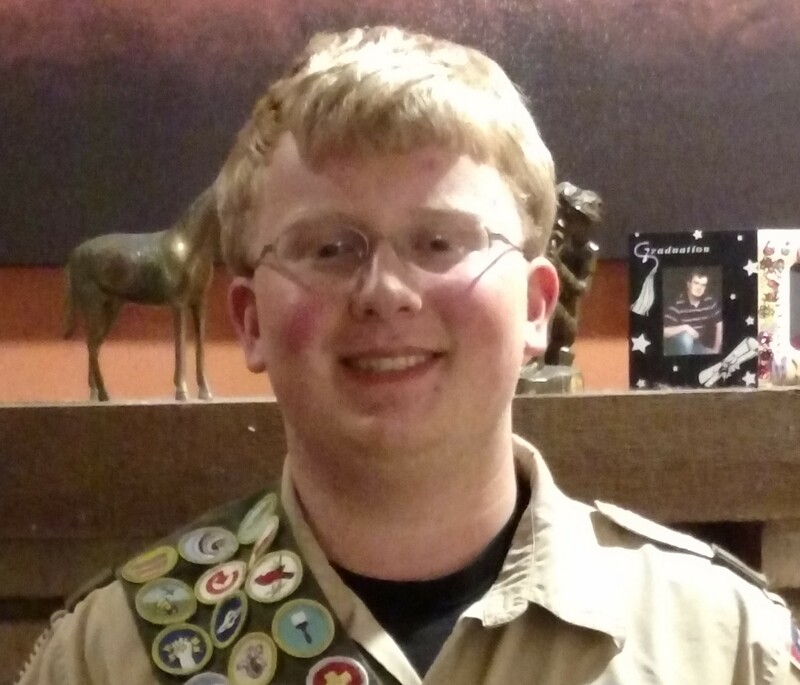 Congratulations to Josh Dragony of Boy Scout Troop 228 in Berea who achieved the Eagle Scout rank in Boy Scout of America. Josh is an OFHS junior and plays the tuba/Sousa in the band. He plans to major in engineering at either Miami University or The Ohio State University while enrolling in the Naval Reserve Officers Training Corps – ROTC. His Eagle Scout Leadership Project was improving the outdoor worship space at Prince of Peace Lutheran Church in Westlake. 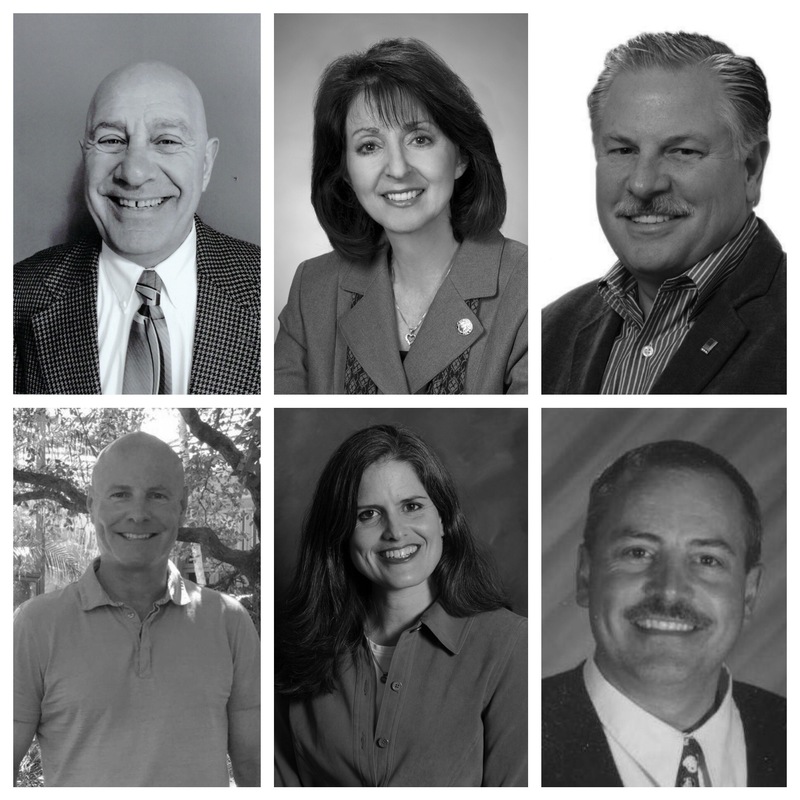 The inductees are Carl Gerbasi, class of 1962, education; Nan A. Baker, ’73, business/politics; Ron Smith, ’75, business/insurance; Greg Butcher, ’76, business/engineering; Pamela Ehresman Pennock, ’90, educator/write and and Kevan Stuber, music/educator. They join 59 notable individuals who are now in the Hall of Fame. The OFHS guidance counselors invite parents to this year’s Coffee & College informational sessions about the college application process. The final morning session is from 8-9 a.m. November 7th in the OFHS Media Center. The next evening session is from 6-7 p.m.* on October 24th in OFHS Room W3. (*Please note change in start time for evening events.) All are on Mondays. To see an informational flyer, click HERE. Parents and students: Learn the ins and outs of applying for financial aid at the October 17th Financial Aid Night that College Now of Greater Cleveland will present in the OFHS Auditorium. Topics for the 7-8 p.m. meeting include helping file FAFSA and other financial-related forms; personalized financial aid guidance, NEW deadlines and resources. OF students also may apply for scholarships who meet eligibility requirements. Contact the Guidance Department, 440-427-6116, to set up an appointment. A flyer is available by clicking HERE. 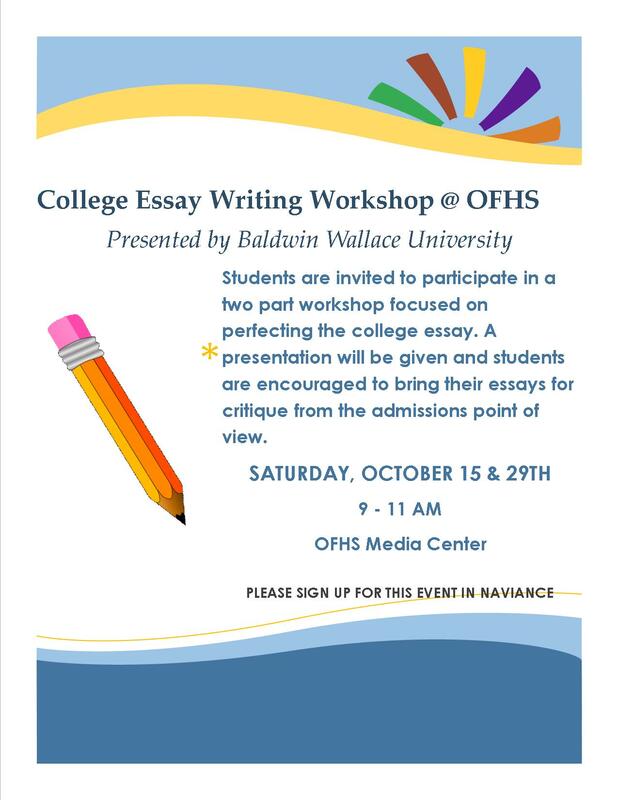 Baldwin Wallace University will present a College Essay Writing Workshop from 9-11 a.m. on Saturdays, October 15th and 29th, in the OFHS Media Center. This two-part workshop will help perfect your college entrance essay. BW personnel will present information and students are encouraged to bring their essays for critique from the admissions point of view. Sign up for this event in Naviance. The PSAT will be administered at OFHS on Wednesday, October 19th. College-bound sophomores and juniors are encouraged to sign up. The cost is $15. Students should sign up in the guidance office. Seats are limited. Need to take the SAT or ACT? Take a free practice test first! Sylvan Learning Center will give you the opportunity to take either test during this workshop. Please bring a No. 2 pencil and graphing/scientific calculator to the exam. Senior Parents – Please join us at our regular monthly meetings which are held at 7 p.m. in the Media Center at Olmsted Falls High School on the third Wednesday of each month. We look forward to seeing you on October 19, 2016! The Olmsted Falls Music Association again is teaming with Easter Seals Northern Ohio in hosting a “Fill the Truck” clothing donation drive. It will be October 22nd and 23rd in the OF Board of Education parking lot. Easter Seals will compensate OFMA based on the number of pounds of cloth items collected. Many items will be accepted, such as clothing, shoes, purse, scarves, gloves, hats, linens, towels – even stained items. The drive cannot accept household items, toys or any items not cloth. All donors will receive a tax-deductible receipt. The truck will be in the parking lot from 9:30 a.m. to 4:30 October 22nd and 1-4 p.m. October 23rd. 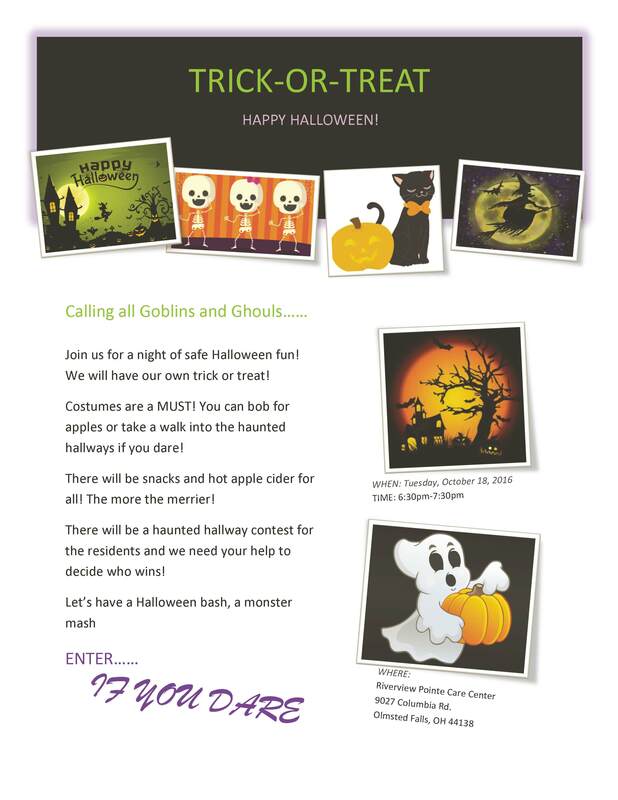 Youngsters and families are invited to a night of safe Halloween fun October 18th at the Riverview Pointe Care Center, 9027 Columbia Road. You can bob for apples or take a walk in the haunted hallways – if you dare. There will be apples and cider as well as treats at this monster mash. Costumes are a MUST. Help decide the winner of the haunted hallway decorating contest. Trick and treat will be open from 6:30-7:30 p.m. on the October 18th Halloween Bash. The Hope Community Church offers families a fun, free time at its Tricks & Treats Halloween Party from 1-4 p.m. October 22nd. Inflatables, snow cones, popcorn, a cake walk, balloon artist, face painting and several booths to play games will be included with the fun. The latest video about the Zero Additional Taxes Bond Issue on the November 8th ballot has just been released. 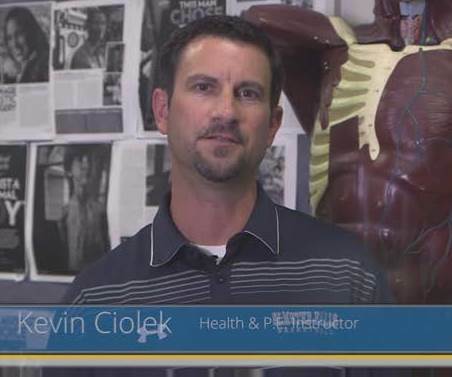 Be sure to watch OFHS Teacher and Coach Kevin Ciolek in this week’s latest video in the in the series put together to share information about the upcoming Bond Issue with the community. To view the newest video now, please click HERE. IT’S HOMECOMING WEEKEND IN BULLDOG COUNTRY! Come cheer on your Bulldogs @ the varsity football game tonight! Arrive early to enjoy Homecoming festivities – including the crowning of the Homecoming King & Queen! 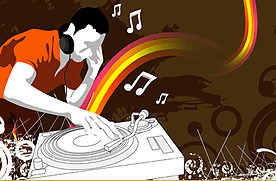 The OFHS Homecoming Dance is from 7:30-10:30 p.m. Saturday, October 8th in the OFHS gymnasium. For additional information, please click HERE. Also – All are invited to attend the FREE Olmsted Falls Kiwanis Pancake Breakfast from 8 a.m. to 1 p.m. this Sunday, October 7th at the OFHS cafeteria. Welcome back to all of our returning Bulldog alumni! Let’s go Bulldogs!!! Happy Homecoming Weekend to all! MASQUERS/FORENSICS PARENTS: 1ST MEETING THIS MONDAY @ 6:30 p.m.
Save the Date! If you are a parent of either a Masquers or a Forensics student – or both – you won’t want to miss this first meeting of the Olmsted Falls Masquers & Forensics Patrons for the new school year. Please join us THIS MONDAY, OCTOBER 10TH @ 6:30 p.m. in room W3 – choir room –at OFHS. Meet new OFMFP President Jamie Wood AND new OFHS Masquers Advisor/Director Carol Thompson. Get an update on the fall play, an overview of plans for this school year and learn more about how you can get involved and support our EXTREMELY talented Masquers and Forensics students. 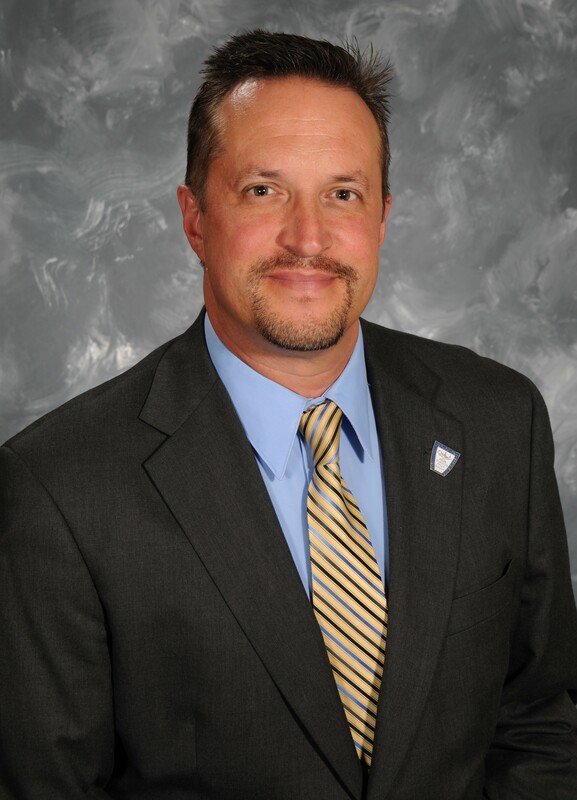 OFSD Superintendent Dr. Jim Lloyd will also be in attendance to talk to the group. Questions? Please contact OFMFP President Jamie Wood at jamiewood68@yahoo.com. Hope to see many of you there! • October 13 from 8-9 a.m.
Tuesday, November 8th is an important day for the education of Olmsted Falls City Schools’ students. That is when voters will decide the outcome of Issue #117, the ZERO ADDITIONAL TAXES school improvement bond issue. Funding from this ballot issue will pay for upgrades to mechanical systems and school renovations so that money will not have to be diverted from the classroom teaching and instructional budget to make vital repairs. To make sure your voice is heard in this important election, please register to vote. Many residents are unaware that they must register to vote again if they have moved or changed their name. Others THINK they are registered but then discover they are not. You are at least 18 years of age on or before the day of the election. You have been a resident of Ohio at least 30 days before the election. Pick up a voter registration form from the administration office, or print a voter registration form from the Ohio Secretary of State at: http://www.sos.state.oh.us/sos/upload/elections/forms/VR_Form_04-2015.pdf. How can I register a change of address? You can do it online: https://olvr.sos.state.oh.us/ovru/Modify.aspx. How long do I have to register to be eligible to vote in the upcoming November 8, 2016 election? The deadline to register to vote is October 11th, 2016. *Third grade girls may try out for the 4th grade team and 2nd grade boys may try out for the 3rd grade team. *Please report for registration 15 minutes before your scheduled tryout time. *Parents will not be permitted in the gym during tryouts. 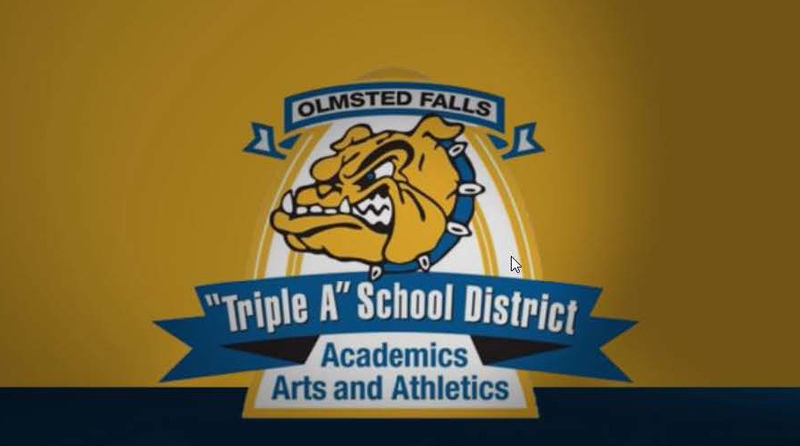 For additional information on OFBA Travel Tryouts and the OFBA Travel Basketball Program, please click HERE for the Olmsted Falls Athletics website, or click HERE to download the official flyer. 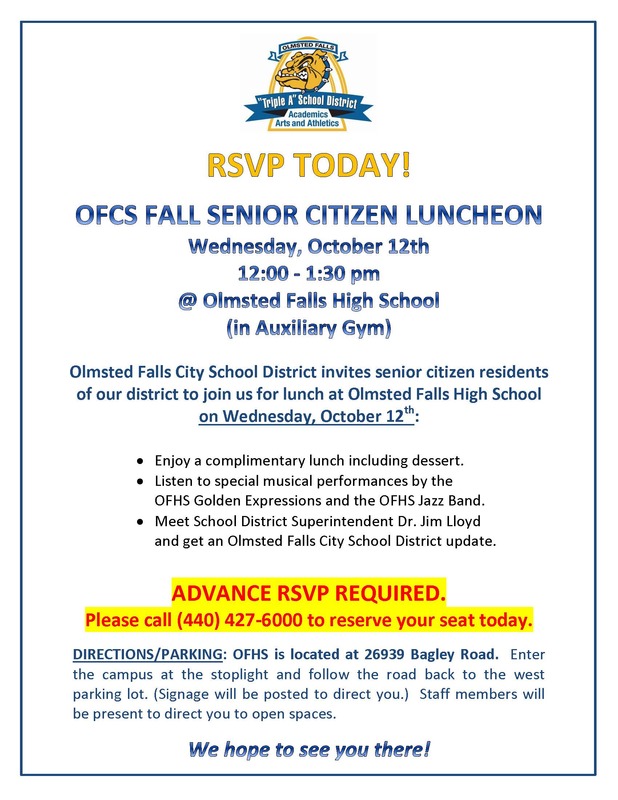 OFCS will host its next luncheon for senior citizen residents of the school district on Wednesday, October 12th. The event will take place at Olmsted Falls High School and starts at 12:00 p.m. Guests will enjoy lunch as well as entertainment provided by our talented music students. Please share this event flyer with any senior citizen family members, neighbors and friends living in the OFCS district. Please note that an advanced RSVP is required to attend. To download a copy of the event flyer, please click HERE. The OFHS guidance counselors invite parents to this year’s Coffee & College informational sessions about the college application process. The morning sessions are from 8-9 a.m. this Monday, October 10th and November 7th in the OFHS Media Center. The next evening session is from 6-7 p.m.* on October 24th in OFHS Room W3. (*Please note change in start time for evening events.) All are on Mondays. To see an informational flyer, click HERE. Registration is open through October 29th, with the cost at $50 if performed by this Monday – October 10th. After that date, it is $60. Present a hard copy of the coupon on the date listed above, and Tony K’s will donate 25% of your food & non-alcoholic beverage purchases to Olmsted Falls Post Prom 2017. Click HERE to download a copy of the coupon.